In the kitchen, where we practice turns and occasionally make food. These arrived today after wandering terra incognito for a full week. I have never actually done a triple in my kitchen before because there are too many things to crack your skull on if you really fall out of a turn. These shoes, though—they sport giant front half-sole pads that feel incredibly secure. The fit is pretty good—a tad looser than my Sanshas in the toe box, which is nice, but still narrow enough in the arch, instep, and heel (my feet are just a bit duckish). Size 8.5B. The pattern on which they’re cut accommodates very flexible arches. I might try size 8 as well, but 8.5 leaves room for my extra-long (and rather prehensile) second toe. 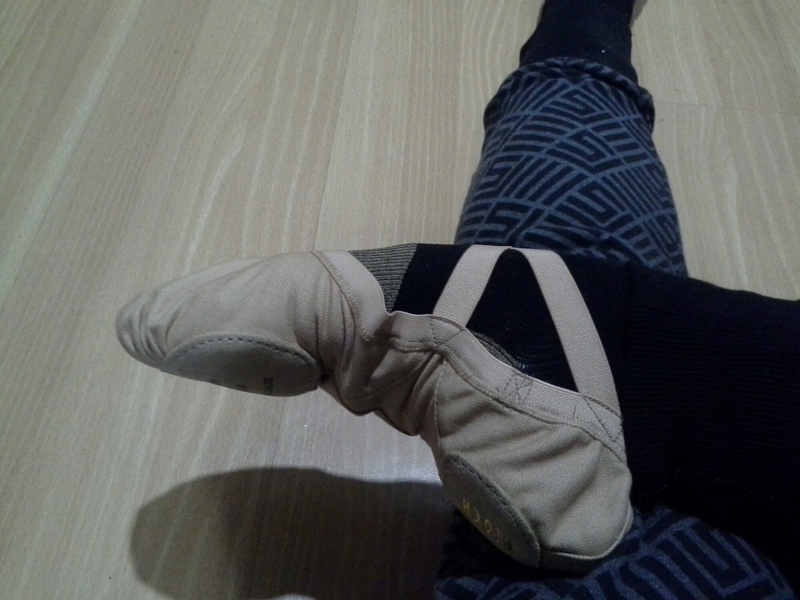 Posted on 2017/01/24, in balllet, kit, review and tagged Bloch Pro Elastic, initial review. Bookmark the permalink. 2 Comments. Are these the fabled stretch canvas jobs? Yes—and they’re much stretchier than my other stretch canvas shoes. I really like them thus far. Edit: Totally worth the wait while they independently explored my neighborhood.